France has numerous higher education (enseignement supérieur) institutions, including over 75 traditional universities (13 in the Paris region) and around 250 grandes écoles and écoles supérieures. Universities are the weakest part of the French education system and are obliged to accept anyone who passes the French baccalauréat examination – some 30 per cent of secondary students (around 1m) – resulting in overcrowding, under-funding and a general lowering of standards. Lecture halls are packed and students have no tutorial system and little supervision. These problems are exacerbated by the length of time it takes to obtain a degree in France. Most courses aren’t tailored to specific careers and, not surprisingly, a huge number of students fail to obtain a degree. Despite the high dropout rate, most people are opposed to limiting admissions, which they feel would compromise the principle of equality. However, the upshot is that unemployment among graduates is high and most universities have little prestige. Although still famous (particularly among foreigners), the Sorbonne is little more than a building housing part of the sprawling Université de Paris, and it has lost much of its eminence within France to the grandes écoles (in fact it’s so overcrowded that conditions are said to be ‘of third world standard’!). Anyone who passes the French baccalauréat examination is guaranteed entry to a university. Schools of medicine, dentistry and pharmacy are attached to certain universities, and, at the end of the first year, there is a selection where only the best 10 per cent are accepted in the second year. Other restricted entry institutions include schools of economics and law. However, one of the most difficult to gain acceptance to is a veterinary school, a popular and lucrative profession in France (where there are over 10m dogs!). There are just four veterinary schools in France, all with a highly competitive entrance examination. Foreign students number around 266,000 or 11.9 per cent of university intake. Most are from North Africa, although there’s a large number from EU countries, South America and China. There are quotas for foreign students at certain universities and for particular courses. For example, foreign students are limited to 5 per cent of the number of French students in medical and dental studies at universities in and around Paris. Foreign students are admitted to French universities on the basis of equivalent qualifications to the French baccalauréat. French univer­sities accept British A Levels as an entrance qualification, but an American high school diploma isn’t generally accepted, and American students must usually have spent a year at college or have a BA, BBA or BSc degree. All foreign students require a thorough knowledge of French, which is usually examined if no baccalauréat certificate is supplied. French language preparatory courses are provided. There’s a special university entrance examination for mature students without a baccalauréat, although mature students are rare in France, where the idea of going back to school after working isn’t popular. During their first two years at university (called Stage I), students study a core curriculum, and in their second year they take the diplôme d’études universitaires générales or DEUG). The DEUG has a high failure rate, almost half of undergraduates failing to complete their degrees, although a new tutoring system, whereby older students help younger ones, has helped to reduce the number who fail. Those who fail may be given a third year to pass, but no longer. Those who pass the DEUG can take a degree (licence) in arts and sciences (equivalent to a BA or BSc) after a further year. The licence is classified as the first year of Stage II studies. However, a two-year DEUG or three-year degree has little value in the French job market, where competition for top jobs is fierce. A maîtrise, roughly equivalent to an MA, is awarded after completion of the second year of Stage II studies, one year after gaining a licence. Students can study for a further three after receiving their maîtrise for a doctorate (doctorat) or Stage III degree. 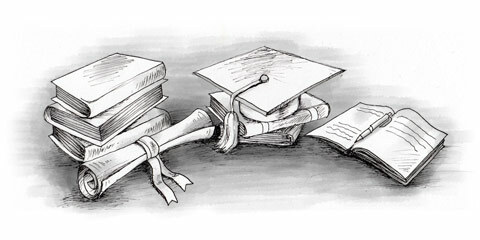 Recent reforms aim to ‘harmonise’ French higher education with that of other European countries by introducing a system known as licence, master, doctorat (LMD) and awarding students ‘credits’ (crédits) for each course. A DEUG, for example, is worth 120 credits and a degree 300. Like most schools, universities offer few extra-curricular sports and social activities. There aren’t even inexpensive university bars in France! Overseas students must complete an initial registration form (dossier de demande de première admission en premier cycle) and lodge their application by 1st February for entry the following October (the academic year runs from October to June). Application forms are available from the cultural sections of French embassies. Applicants must present a residence permit valid for at least a year or that of their parents if the latter have a three-year residence permit. Applicants apply for three universities, at least two of which must be outside Paris. There’s no central clearing system and applicants must apply to each university separately. Most French students normally apply via their school, which submits their applications for them. University students don’t pay tuition fees, and costs for foreign students are minimal. Between €150 and €300, depending on the options chosen, is sufficient to cover registration fees, including obligatory fees for health insurance and social security. Students over 26 are required to take out health insurance in their country of origin or insurance under the French social security system on arrival in France. Government grants (bourse) are awarded to 20 per cent of students. The maximum grant is now around €3,000 per year, although most are less than €1,000. Some 12,000 grants of around €400 per month are available to students wishing to study abroad. Note that students require numerous passport-size photographs (usually on a white background) and photocopies and translations of assorted documents. To apply for a grant, students must prepare a dossier social étudiant by the end of April and submit it to the Centre National des Oeuvres Universitaires et Scolaires (CNOUS). Banks will make long-term, low-interest loans for quite large amounts if they judge the application to come from a high-calibre student. Scholarships are also provided by international organisations and foreign governments. Parents are obliged by law to support their children at university until they’re 20, after which age they’re officially financially self-reliant. One in three students support themselves during their studies by working part-time during terms and over holiday periods. Foreign students must make their own arrangements for accommodation. Students are eligible for a room in a university hall of residence, although places are limited and accommodation is generally of poor quality. Students should expect to pay around €150 per month for a room in a hall of residence and between €225 and €300 per month for a private room (or more in Paris). Foreign students need around €600 to €1,000 per month to live in Paris (less in the provinces). Many students attend the nearest university to their home and treat university as an extension of school, particularly in Paris and other large cities where accommodation is expensive. Somewhat surprisingly in a country boasting of its commitment to equality (égalité), France has the most elitist higher education system in the world. Grandes écoles and écoles supérieures are university colleges specialising in professional training, to which entrance is by competitive examination (concours). Before being eligible for a grande école, students must spend two years at a special preparatory school (Classes Préparatoires aux Grandes Écoles/CPGE). Although they’re required to work hard, with little time for play, students at grandes écoles enjoy a pampered and privileged existence. Compared with the impoverished and overcrowded universities, grandes écoles are lavishly funded and equipped. The state spends around €40,000 educating a student at a grande école, compared with just €12,000 at a university. They’re castigated for elitism, perpetuating the class system. Only 1 per cent of grandes écoles students come from a working class background compared with around 15 per cent in universities. Critics of grandes écoles also complain that they undermine France’s universities, which as a result are the weakest part of the country’s educational system. The most celebrated grandes écoles include the Conservatoire National des Arts et Métiers (CNAM), Ecole Centrale, Ecole Polytechnique (usually known simply as X from its badge of crossed cannons), Ecole des Ponts et Chaussées (known as Ponts) and Ecole des Mines (all engineering), Ecole des Hautes Etudes Commerciales/HEC, Ecole Supérieure de Commerce/Sup de Co and Ecole Supérieure des Sciences Economiques et Commerciales (ESSEC - business and management), Ecole Normale Supérieure/ENS/Normal Sup (research and teaching), Institut d’Etudes Politiques/IEP/Sciences Po (politics), Ecole Nationale Supérieure des Beaux-Arts (fine arts) and Ecole Nationale d’Agronomie (agriculture). The cream of grandes écoles and the most recent is the Ecole Nationale d’Administration/ENA, the post-graduate nursery of France’s civil service mandarins and political elite (graduates are called énarques). A magnificent career is virtually guaranteed to graduates of grandes écoles, who fill the top positions in government, the civil service and most industries in France. Many companies appoint only grande école graduates to management positions, and they’re usually preferred to business school graduates with an MBA. It’s common practice for newspaper articles to state the grande école attended by a prominent academic, executive or politician, and many graduates include it on their business cards. There are a number of American colleges and universities in France, including the American University in Paris (AUP), where all classes are taught in English and the 1,000 strong student body comes from over 70 countries. The AUP offers both BA and BSc degrees, and students can study for a BA in seven fields, including international business, art, history and European culture. Fees for a full academic year are around €25,370, excluding health insurance, accommodation and deposits. A popular American college in Paris is the Parsons School of Design (a division of New York’s New School for Social Research), where students take a four-year Bachelor of Fine Arts (BFA) degree. The Paris American Academy, which specialises in fine arts, fashion, languages and interior design, also has a good reputation. There are many other American colleges in Paris offering courses in a range of subjects and degrees (from a BA to an MBA). The Centre Régional des Oeuvres Universitaires et Scolaires (CROUS, 01 40 51 36 00) is responsible for foreign students in France and provides information about courses, grants and accommodation. CROUS subsidises university accommodation and restaurants, but not all are subsidised so you should contact CROUS before choosing a university. In Paris, students can contact the Centre National des Oeuvres Universitaires et Scolaires (CNOUS, 01 44 18 53 00). The French Ministry of Education’s website gives information about the organisation of the French university system, and the cultural sections of French embassies provide information about higher education. A complete list of the state and private universities in France, entitled Le Guide des Études Supérieures, is published annually by L’Étudiant magazine. All state universities are also listed on the Education Ministry’s website (see above), and the Ministry has recently set up a new site aimed at making it easier for students who have obtained their bac to find a suitable course in France or abroad, obtain a grant and even find accommodation.